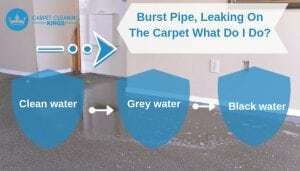 Water Damage Burst Pipe, Leaking On The Carpet What Do I Do? Suffering a flood to your home is a traumatic experience and unfortunately one of the main casualties is your carpet. Once it’s totally wet through, then it could be that both it and the pad beneath may need replacing, which is an added expense that most homeowners could do without. In the case of severe flooding either from natural causes or a broken pipe, many people think that there is no chance of saving their carpet. However, this isn’t necessarily the case. Read on to find out more about 3 different types of water damage and how it could affect your carpet. Clean water flooding refers to flood damage from a bath or sink that’s overflowed, a broken pipe, or a washing machine that’s malfunctioned. Typically this type of water has been treated and contains no waste or contaminants. If it is CLEAN water, then in most cases Carpet Cleaning Kings are likely to be able to save your rugs, carpets, area mats, and floor pads. before we can help though we recommend Brisbane Plumbing and Drainage to fix the cause of the water. This refers to water that has been used but which doesn’t contain any contaminants or solid human or animal waste. This could include a washing machine which has spilled out all its water mid-cycle or a toilet that has overflowed. Potentially this water could cause illness although there is unlikely to be a risk of disease since there is no solid waste. In this example the carpet pad needs to be disposed of for safety reasons but the carpet can often be saved. We can usually clean, dry, and disinfect carpets damaged by grey waste. This is the type of dangerous water involved in a flooding which carries solid waste and has the potential to cause disease too. If your flood was caused by a storm, sewage back-up, or natural disaster, then for the health of yourself and your family, we’d always recommend your carpets be replaced. If you’ve got a flooding emergency then Carpet Cleaning Kings is here to help. We provide a 24/7 professional service with experienced technicians and have the expertise and equipment to deal with all flood and water damage emergencies. Give us a call on 1300 7000 75. What’s The Low Down On Green Carpet Cleaning?